Snapchat is ditching its ephemeral nature — well, kind of. 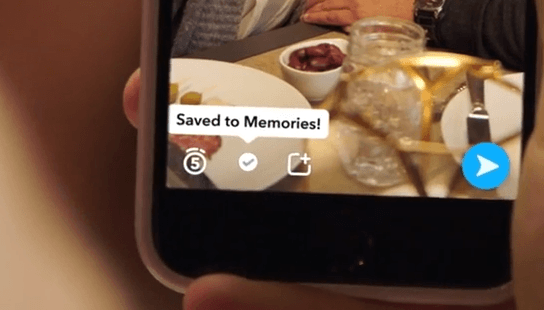 A new feature named ‘Memories’ will let you save “personal moments” forever for sharing beyond the stream. Memories will live just under the camera button. All you have to do is swipe upwards to view your saved pics and video. Searches for snaps or stories things like ‘Hawaii’ can be found instantly and shared Memories, too. We’ve also created a new way to send Snaps from Memories to your friends, or even post them to your Story. If you post a Snap you took more than a day ago to your Story, it will appear with a frame around it so that everyone knows it’s from the past. Memories will be rolling out over the next month or so, as it’s a pretty significant feature. None of your saved pictures or videos will be written to your phone’s photo album, so Snapchat is finalizing a way to securely save your stuff to its servers. Which may not be very secure, so be careful about what you save to Memories.